Whenever I make soup, I always buy a couple of those boxes of chicken or vegetable broth from the grocery store. They're a cut above the sodium-laden canned stuff, but lots of cooks swear by making their own. I just never took the time to do it, until now. I also tend to use canned beans. It's just easier. 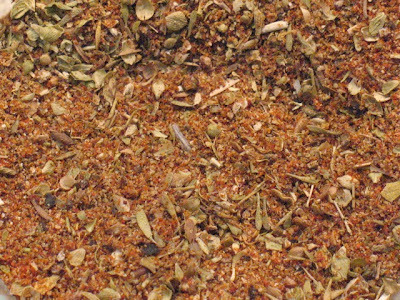 But lots of cooks swear by the dried kind for delivering better texture and flavor. As a kid, I used to make black bean soup with dried beans, which meant thinking ahead to make sure they soaked overnight. This recipe doesn't require overnight soaking, although you do need 15 minutes of cooking time, plus an hour soak. So while it's still not a quick fix, it doesn't mean dinner is off if you didn't remember to soak the beans before you went to bed. There's no one right way to make vegetable stock. After all, it's just liquid flavored by vegetables, herbs and seasoning. The possibilities are endless. 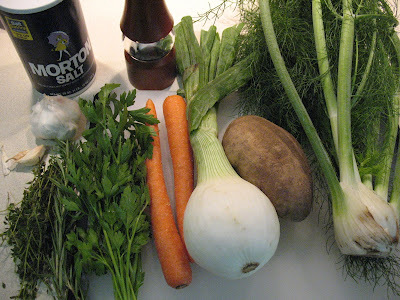 For mine, I chose fennel as the centerpiece flavor, using both the bulb and the stalks. Potato helps give the stock some body from leaching some of its starch. A hearty blend of herbs adds some refinement and green notes. Feel free to use less salt if that's something you're concerned about. After I'd added the tablespoon, I was concerned it was too much, but then I did the math and figured out it was only slightly more than the "reduced sodium" brands of broth and way way less than the amount in those dried chicken stock cubes. 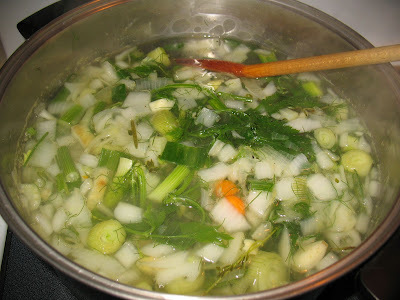 When making the soup, I didn't add any herbs, since so many herbs were used to make the stock. You certainly could finish the soup with a sprinkle of chopped Italian parsley or fennel fronds, for example. 1. Place beans in a large (4-quart) saucepan covered with 2 inches of water. Bring to boil then reduce heat and simmer for about 5 minutes. Remove from heat, cover and let sit for an hour. Drain before adding to soup pot. 2. In dutch over or other large pot, heat olive oil over medium heat. 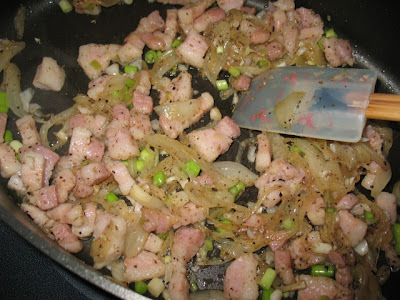 Add fennel, garlic and onions and sauté until softened and starting to take on some color. Add the tomatoes and kielbasa, and continue cooking a couple minutes. Add the cooked, drained beans, smoked paprika and the vegetable stock, adding extra stock or water if needed to cover the ingredients. 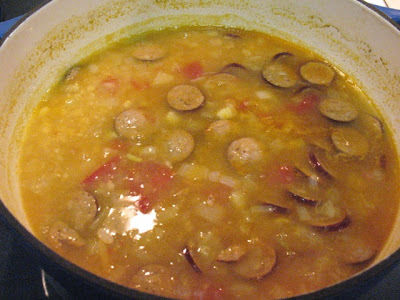 Bring to boil, reduce heat, cover and simmer gently for about 60 to 90 minutes until the beans are tender. 3. If desired, stick an immersion blender in the soup and pulse a few times to thicken it. 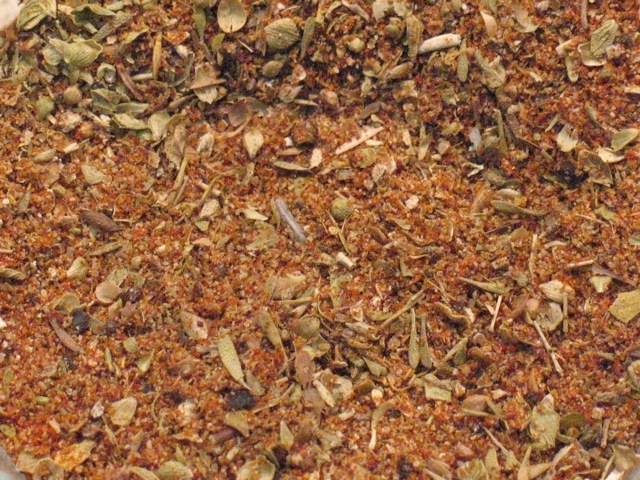 Taste and adjust seasoning before serving. 1. Add all ingredients to a large pot. Bring to boil then reduce heat and simmer, covered, for about 2 hours. Strain the liquid and refrigerate until ready to use. Cook In / Dine Out is really busy tonight preparing for the summer office dessert contest (chocolate cake with peanut butter-cream cheese frosting). So this is going to be a quick FSF, following a new format: top 5 for each. 1) "A Rat Pack of Reviewers," by Julia Moskin. Moskin's feature chronicles the daily life of three Las Vegas restaurant critics with varied backgrounds from the buttoned-up John Curtas to the mohawked Al Mancini. It's an inviting look into the food culture of America's hospitality capital, which is more than just steakhouses these days. 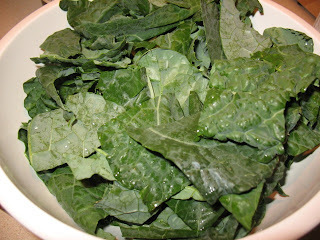 2) "Across the Country, The Menu Expands," How to Cook Everything column by Mark Bittman. Bittman reflects on recent a cross-country road trip with his daughter and how the foods they encountered, while not always haute cuisine, are showing an increasing level of quality and variety from what they experienced on a similar trip just a few years ago. 3) "Help for the Gooey Fingered," review by Julia Moskin. Moskin also reviewed the new free iPad app from food website and magazine Gilt Taste. Its recipes include an innovative "fingers free" feature whereby you wave your hand in front of the iPad camera to switch between steps. I just tried it out and although it didn't work perfectly, I think with practice this could be great. Would love to see Mark Bittman's app implement something similar. 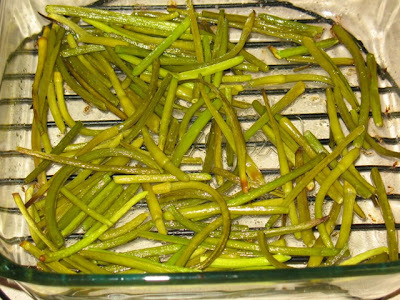 4) "A Summer Salad the French Might Recognize," recipe for French Potato and Green Bean Salad by David Tanis. Apparently I'm not the only one with Salade Niçoise on the mind, as David Tanis offers this simple version. 5) "Thailand Extends to Brooklyn," Pok Pok Ny restaurant review by Pete Wells. Portland-based Thai restauranteur/chef Andy Ricker's second New York outpost nets a two-star review. On the plus side: innovative Thai cooking. On the minus side: a small restroom and no reservations. Sounds like a place for those who enjoy waits. 1) "Who could make such a cake? You." The Process column by David Hagedorn. David Hagedorn is my hero this week. I loved his Process column, which tackled Momofuku Milk Bar pastry chef Christina Tosi's Lemon Berry Crunch Cake. It is similar conceptually to the Arnold Palmer Cake featured in the second issue of Lucky Peach: the idea is to build a 6-inch, 3-layer cake sandwich additional layers of frosting and/or filling. David breaks the process down, clearly explaining the equipment involved and how the cake really isn't that hard to make if you allow yourself time (several days) to complete its various steps. We even bonded over our love of Tosi's corn cookies during today's Free Range chat. 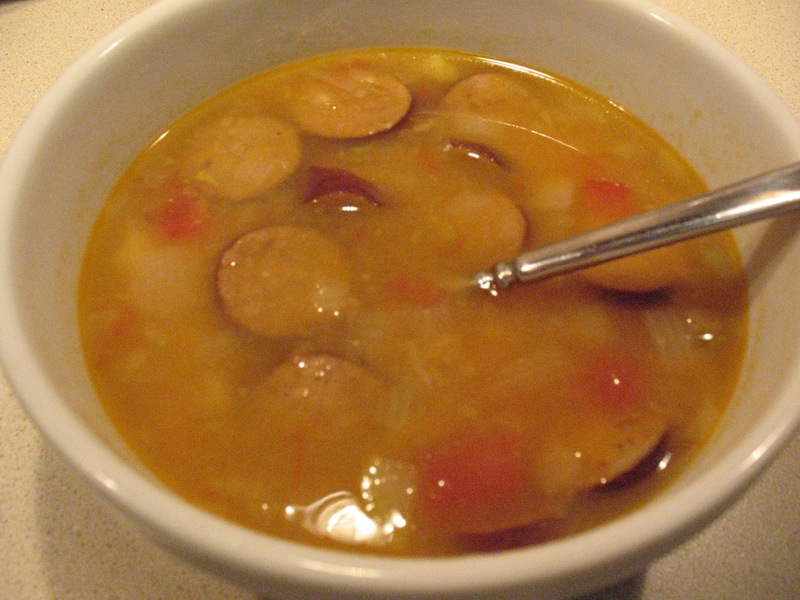 2) "Someone's upgraded my bean cuisine," Cooking for One column by Joe Yonan. Joe declares his love of beans this week, which is something I can get behind. In particular, he points out how much better dried beans are than canned; I completely agree, and am trying to use them instead as much as is practical, particularly for soups. Related recipes: Asian Bean and Barley Salad and Lentil, Beet and Orange Salad. 3) "Lighten up: how to make a summer picnic simple, smart and Southern," feature by Bonnie S. Benwick. Bonnie provides the Fourth of July picnic hook up with a bevy of tasty back page recipes, including Oven-Fried Chicken on a Stick. 4) "Noble rot can lead to a silly grin," Wine column by Jason Wilson. Interesting wine column on oft-overlooked sweet wines. 5) "Pasta and Zucchini with Lemon-Basil Ricotta Cream," Nourish recipe by Stephanie Witt Sedgwick. This sounds really good, and I bet it would be great with fresh ricotta, which I have recently learned how to make (and will share with you soon). Bonus: 1) The tomato recipe contest starts with entries due July 24, 2) Jose Andrés is relocating Minibar to the former Zola Wine & Kitchen space, coinciding with the end of America Eats Tavern which will close next week, 3) Rasika's Vikram Sunderam was the Restaurant Association Metropolitan Washington "Rammy" award for best chef. The Washington Post. The Times' Las Vegas feature was interesting, but David Hagedorn's forray into Momofuku Milk Bar cooking really captured by attention. We are officially halfway through the year, and the score is tied! Blue cheese, nuts and fruit are a trio always welcome in salad, especially in the fall, when seasonal apples taste so good with sharp cheese and toasted nuts. I wanted to pair those flavors with some seasonal produce, making a hearty entrée salad. Since the Kale Ceasar Salad was such a big hit, and Kale is in-season for like half the year, I figured it was time for a second take on kale salad, this time with more flavors. It also gave me another chance to use the French breakfast radishes I used in the Roasted Beet and Carrot Salad with Chèvre, Spring Herbs and Coffee Soil. 1. Heat the olive oil in a medium frying pan over medium heat. When hot, pat the chicken dry and sauté in pan until cooked through, about 10 minutes, flipping the chicken halfway. Season with seasoned salt and fresh-ground black pepper. Set aside to cool and then slice into bite-size pieces. 2. Heat a small frying pan over just-under medium heat. Toast the sliced almonds until lightly browned, shaking occasionally to prevent burning. Set aside. 3. 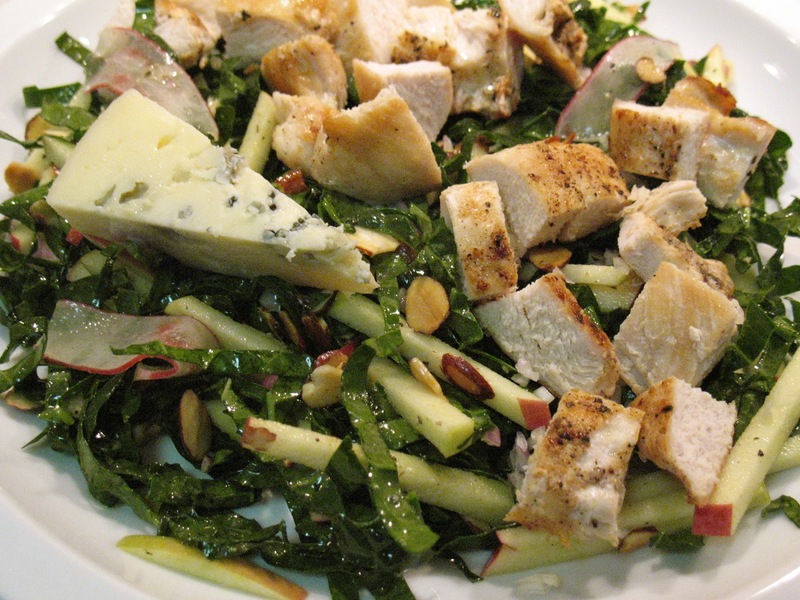 Combine the kale, apple and radishes in a large bowl. Whisk together the dressing ingredients and toss with the salad (it works best to whisk together everything but the olive oil first and then add the oil and whisk it in last). Serve salad topped with sautéed chicken, toasted almonds and a wedge of blue cheese. Last year, Chris and I had lunch at Volt, the Frederick, Md., restaurant from Top Chef runner-up Bryan Voltaggio. 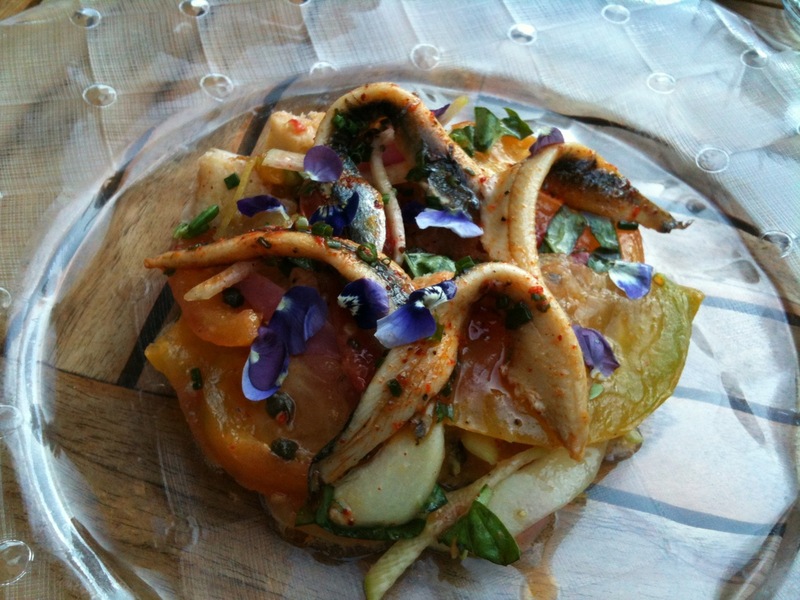 It was an amazing meal, ranking among the best restaurant experiences we had last year. Although all the food was good, the most unforgettable dish was my starter: a beet salad beautifully composed to resemble a vegetable garden, complete with coffee "soil." With many of the ingredients from that dish available to me at the farmers market, I decided it would be a fun challenge to see if I could create something similar. Of course, Voltaggio's dish was a lot more complicated than mine, but I felt the essential elements were roasted beets and carrots, the coffee soil, radishes, goat cheese, some seasonal herbs and a balsamic vinaigrette. For the coffee soil, I started with this recipe, cut it in half and substituted hazelnuts, since I think they have an earthier flavor than macadamia. Even cutting it in half produced way more than I needed for two salads, so I plan to use the rest for something else (perhaps as topping for mint ice cream). I used a combination of purple and yellow beets. The yellow beets were a bunch in varying sizes. 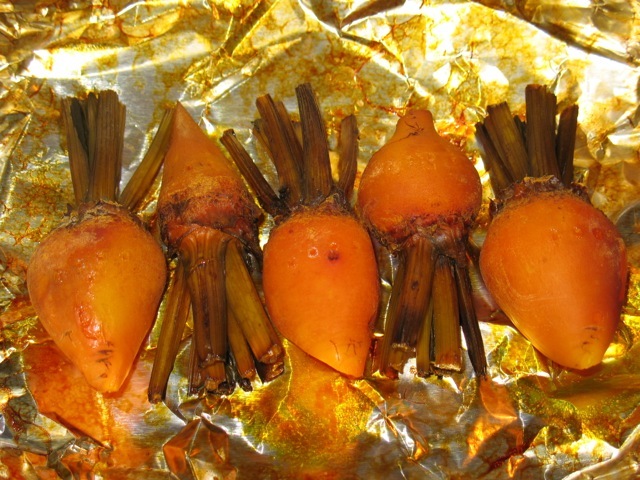 After roasting, I left the little ones whole, while slicing the larger yellow and purple ones. 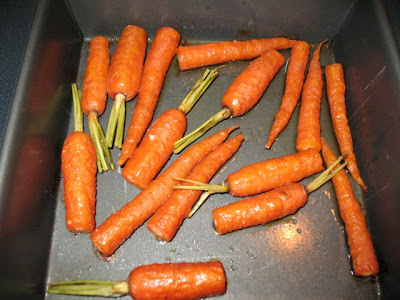 For the carrots, I used baby carrots--the kind that still have the carrot tops attached, not the little bagged pellets cut from larger carrots. The most delicate part of the carrot tops also went into the dish as one of its herbs (I discarded the tougher stems and used only the leafy fronds). 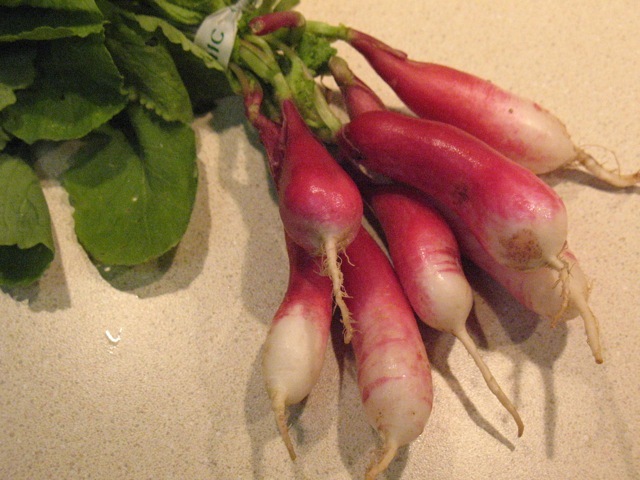 My farmers market had a rather unusual radish: the French breakfast radish, which is long and slender instead of round like a typical radish. It's a bit milder too, although there's still a bit of peppery bite. To honor its shape, instead of slicing across the radishes, I used a vegetable peeler to make long, thin strips. I wanted microgreens, but my market didn't have them, so instead I cut little pieces off of pea shoots. I also used some snipped chives and carrot fronds for spring color. The cheese I selected was Cypress Grove's Humboldt Fog Chèvre, a soft domestic goat cheese. Lastly, for the dressing, I kept it simple with reduced balsamic vinaigrette made with honey, a really good extra-virgin olive oil (McEvoy Ranch), and salt and pepper. As lovely as this dish is to look at, the good news is that it tastes really good too. A nice surprise was how the reduced balsamic vinegar mixed nicely with the coffee soil, creating a sweet, earthy, pungent flavor with a granular texture. 8-10 beets, a mix of sizes (I used 2 large purple, 2 medium yellow, and 5 small yellow), if beet greens are attached, cut to leave about 1 inch of the stems attached. 1. Preheat oven to 400 F. Divide beets into groups by size. Wrap each group in aluminum foil, place on a baking sheet and roast until tender when pierced with a fork (for my beets, I did 45 minutes for the small ones, 60 minutes for the medium ones, and 70 minutes for the large ones). Once cooled, use your fingers to peel the beets and discard the peels. 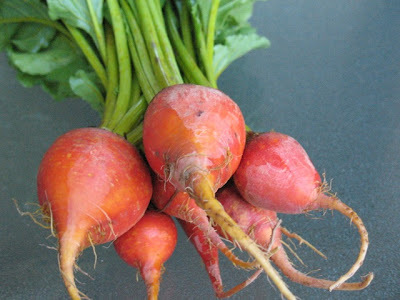 Slice the medium and large beets into 1/2-inch thick slices. 2. Toss carrots with 2 tbsp. olive oil, sprinkle with salt and place in a small roasting pan. Roast at 400 F for about 30-35 minutes (I did it alongside the beets). 4. 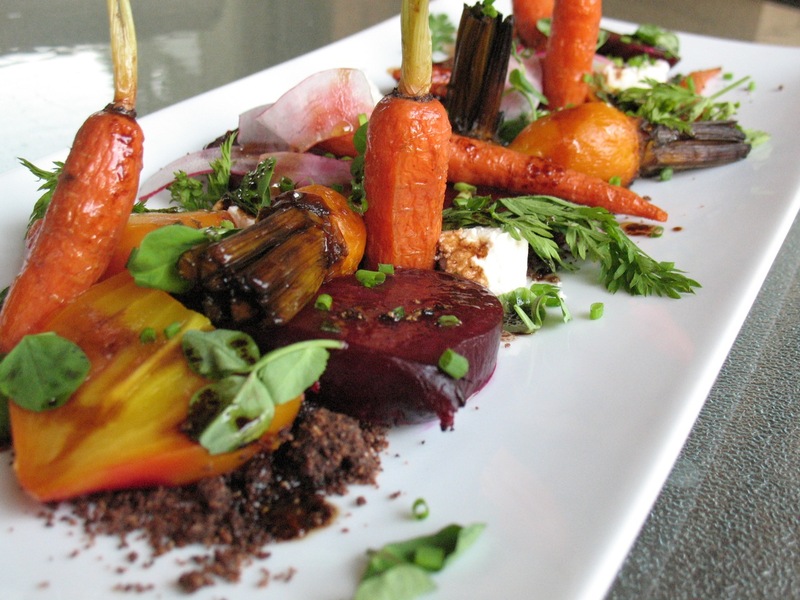 To compose each salad, sprinkle 1/4 cup of coffee soil on plate. 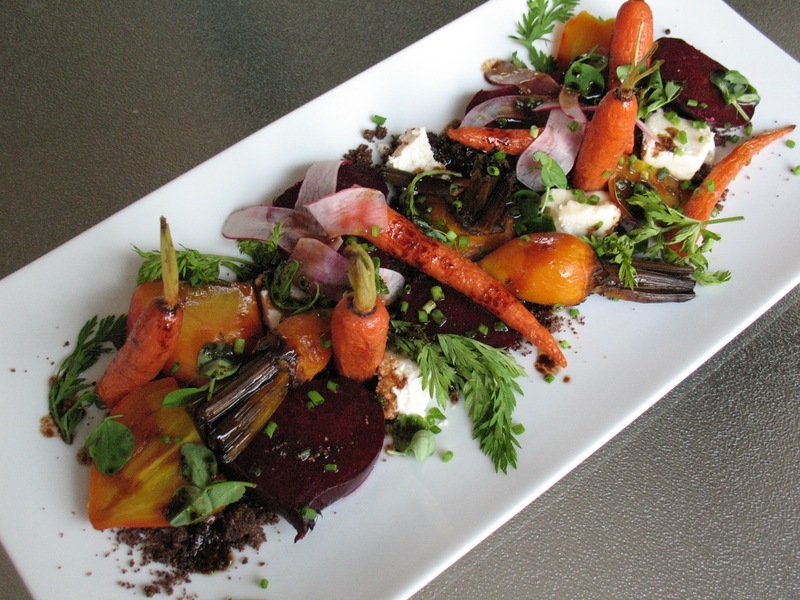 Divide goat cheese into small pieces and arrange evenly on top of soil. Then arrange roasted beets and carrots. Place radish shavings on top of radishes (I tried to make them look like flowers). 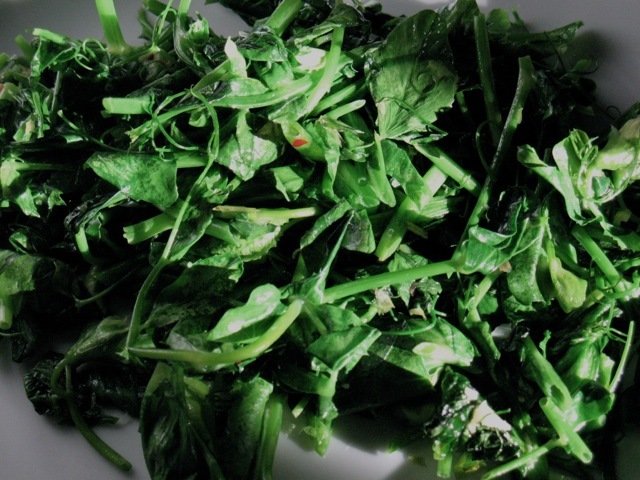 Sprinkle with pea shoots, carrot fronds and chives. Finally, drizzle each salad with half of the vinaigrette. 2. Toast hazelnuts over medium-low heat in a frying pan until fragrant. Dump nuts onto a kitchen towel, fold towel over nuts and rub to remove skins. 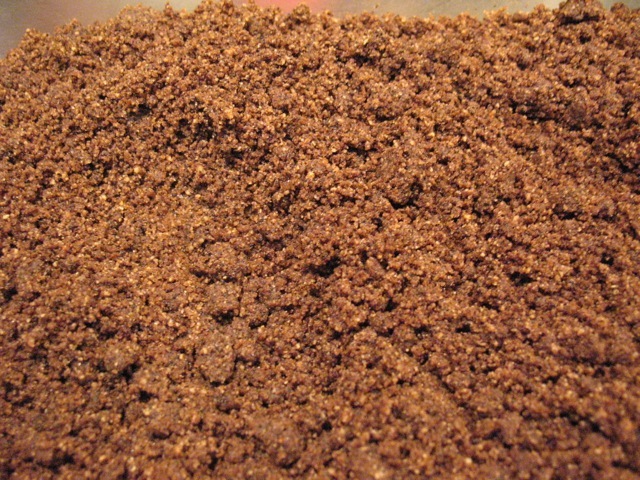 Once cooled, grind nuts in a food processor until fine. 3. Combine ground hazelnuts with all other ingredients except butter in a food processor and process until well combined. Dump mixture into a large bowl, pour melted butter over dry ingredients, and stir until well combined. 4. Spread mixture out onto a parchment-lined baking sheet, making a thin layer. Bake for 12 minutes. 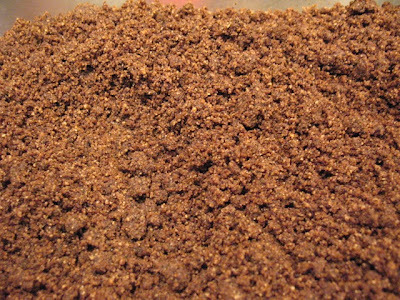 Once cooled, use a spoon to crush mixture into a powdery "soil." Transfer to an air-tight container and store in the refrigerator. The best Chicago pizza is probably had in Chicago, but regardless of whether it's authentic "Chicago" pizza, Armand's pizza is just really good. It's a shame then that rising costs have forced the D.C. chain to close its first branch in Tenleytown on Wisconsin Avenue at the end of the month. Armand's is a beloved pizza institution. This was the chains first branch, opened in 1975, which has since received a number of accolades. It is frequently cited in publications like Washingtonian as among the best pizza chains in the area. It has hosted birthday parties for presidents' children, and D.C.'s current most famous foodie Michelle Obama has been there. For me personally, it is sad, since it has been our favorite pizza for many years. Sure, we could go to one of the remaining branches (and I imagine we will), but given their distance, it won't be as often, and we will no longer be able to enjoy having their pizza delivered at home (where will we get our pizza delivery now?!). 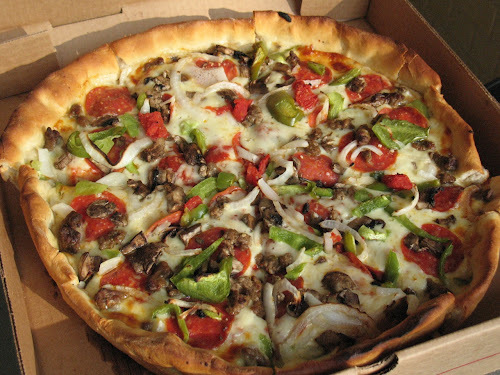 Our favorite pie is their Original Chicago Combo, a balanced combination of meat and vegetable toppings featuring Italian sausage, pepperoni, onions, green pepper, tomatoes and mushrooms. It is deeply satisfying. We're trying to get our fill before the doors close June 30. I'm having it tonight in fact. Recently, a coworker shared a quinoa pilaf recipe that had an element I was really excited about: roasted tomatoes. By now, farmers markets have "hot house" tomatoes, a.k.a. greenhouse or indoor tomatoes. They aren't as good as ripe, outdoor grown tomatoes that will be arriving in mid-summer; however, they are still worlds better than the artificially "ripened" grocery store tomatoes from Florida. These are greenhouse (aka "hot house") tomatoes, but can you tell? They are beautifully red inside, juicy and sweet. Although I usually wait for the real deal to get my annual tomato fix, the farmer at my neighborhood market assured me his hot house tomatoes are worthwhile and he's right, they are awfully good. Anyway, I'm off track. So my coworker shared this amazing quinoa recipe, from which I've adapted elements for this dish, primarily the tomatoes. A sprinkle of brown sugar augments their sweetness. They would be great spread on toasted Italian bread or tossed with pasta. I had sugar snap peas, so I tossed those in along with some corn for color and just because I think corn goes great with fish. A sprinkle of basil pulls it all together. 1. 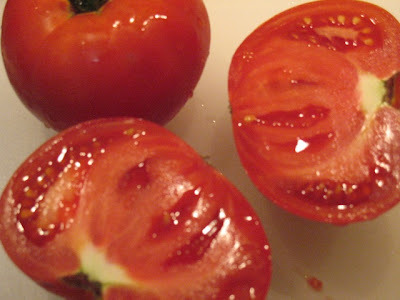 Preheat oven to 400 F. Add tomatoes to a 9 x 9 glass baking dish (do not cook tomatoes in uncoated aluminum cookware, as their acid will dissolve the metal), toss with 1 tbsp. olive oil, brown sugar and salt. Roast for about 35-40 minutes. Set aside (can be made ahead and then reheated in the microwave). 2. Bring 1 1/4 cups water to boil. Add quinoa, cover, reduce heat and simmer for 15 minutes. Remove from heat and leave covered 5 minutes. Set aside. 3. Bring a medium saucepan of water to boil, add snap peas and cook 3 minutes. Drain and place peas in ice water bath. 4. Heat 1 tbsp. olive oil in a large frying pan. 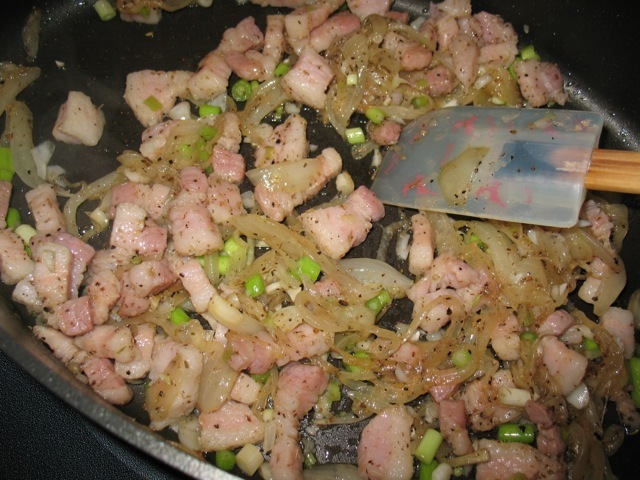 Add shallot and sauté until softened, about 5 minutes. 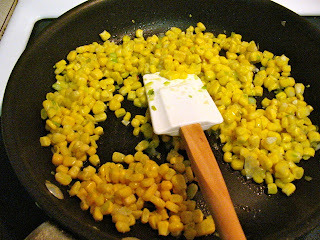 Add corn and cook another 5 minutes. Add blanched snap peas and cooked quinoa season with salt and pepper and continue cooking until heated through. 5. Preheat broiler with oven rack in highest position. Place tilapia fillets on lined, oiled baking sheet and broil 8 minutes, rotating pan every 2 minutes and flipping fillets after the first 4 minutes. 6. 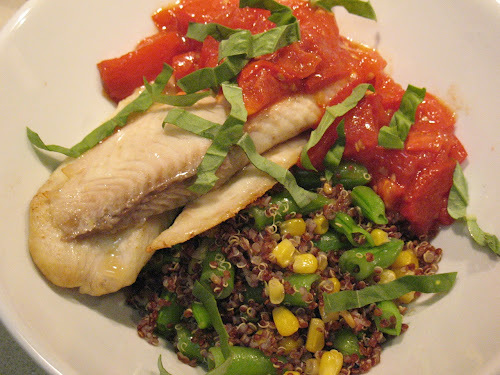 Serve quinoa in bowls, topped with tilapia and spoon tomatoes over fish with a sprinkle of basil on top. After last week's tie, The Washington Post put up a good front this week, adding a Food Security supplement, in addition to the Food section content. The supplement, a product of Washington Post Live, is a write-up of a Post-sponsored summit where they convened experts to discuss pressing problems with the food supply, including Jonathan Bloom's story about how 40 percent of food grown or raised in the U.S. is wasted rather than eaten, Tim Carman's pieces about D.C. Central Kitchen's efforts to get fresh fruit to D.C.'s "food deserts" (a term to denote poor neighborhoods underserved by outlets providing produce and other fresh foods; Tracie McMillan wrote about it in The American Way of Eating). And Deborah Atwood tackles the looming problem of how we, as a global civilization, will feed the 9 billion of us expected to exist in less than 30 years. It's a worthwhile section that tackles everything from obesity to hunger and the Post deserves credit for running it in a time when too many of us spend too much time eating and too little thinking about it. Food section proper had its share of interesting content this week too. Tim Carman, whose propensity to cover esoteric topics was debated during last week's Free Range on Food (with me offering a staunch defense of Mr. Carman), is at it again with his article on ebelskivers, a Danish pancake ball that requires a special pan with round slots for the dough. Sounds tasty though; Carman offers up a fig and prosciutto version. Bonnie Benwick tackles making Scallops an approachable weekday meal with her Seared Scallops with Herbed Apricot Sauce for Dinner in Minutes. The back page recipes highlight ingredients from the farmers market, a theme my own cooking has reflected lately. 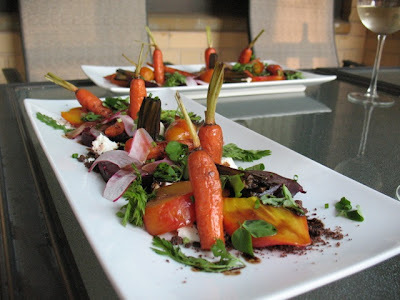 Recipes for Roasted Ratatouille Tart with Goat Cheese and Mint and Roasted Young Onions with Strawberry Gastrique, Bacon and Market Greens both sound fantastic. Lastly, I want to note Tom Sietsema's First Bite, which highlights Tel'Veh, the new Mount Vernon Triangle wine bar and eatery that is, unfortunately, more impressive looking than tasting. My favorite article in the Times this week is Pete Well's review of the restaurant Nomad, the less fancy, less expensive cousin to Eleven Madison Park, one of New York's premier dining establishments (really, one of the world's premier dining establishments). At Nomad, chef Daniel Humm reinterprets and simplifies many of the dishes he's know for at Eleven Madison Park into something more accessible to the average diner (although judging from the slide show, the restaurant is by no means average). In a space inspired by the Rolling Stones no less. Wells awards it 3 stars. It's definitely on my shortlist of New York places I'd like to try within the year. David Tanis' recipe for Golden Beet and Beet Greens Salad with Yogurt, Mint and Dill is a lesson on how to use the whole beet without discarding the greens (I recently used beet greens in a dish with kale and it was great). Finally, Dining weighs in on the massively popular new Dorito taco at Taco Bell and finds that's not bad actually. Interesting. The Washington Post. Although Pete Wells' review of Nomad was my favorite thing I read today, the breadth of good stories from The Post clinches its victory. About a year ago I made garlic scape pesto for the first time. I saw the scapes at the farmers market and had never heard of them before. A little online research revealed that people 1) get really excited about garlic scapes, which are available at farmers markets for a limited time and 2) generally make pesto with them. 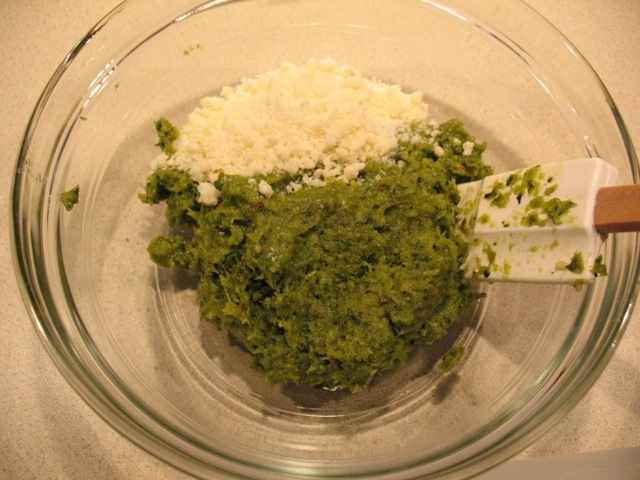 So I took the plunge and made the most beautiful bright green garlic scape pesto. And after tossing it with some pasta and eating it, the next day I realized that sometimes the "you are what you eat" maxim can get a little too literal. It was really intense. Too much so actually. I oozed garlic. I tasted garlic for days. I'm pretty sure my DNA temporarily converted to that of garlic. 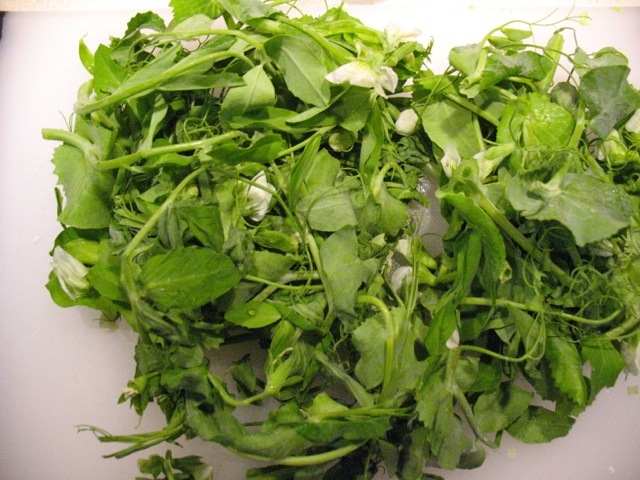 This may seem like a lot of pea shoots, but they are pretty delicate and wilt quickly. Nonetheless, when the garlic scapes showed up at the market this year, I bought them again. This time would be different though, and I had a plan. Roasting garlic mellows out its flavor, turning those hard, pungent cloves into something soft and buttery. Could roasting be the key to making a garlic scape pesto that wouldn't make everyone avoid me this next day? So far so good. The pesto wasn't as bright green, but it was pleasingly garlicky, just not overwhelmingly so. It paired nicely with the tomatoes and the fresh ricotta which, when mixed into the pasta, combined with the cooked tomatoes to make a thick sauce. A little pasta water might help give the sauce some more body. 1. Bring a large salted pot of water to boil. Cook pasta according to package directions for al dente. Drain and set aside in the pot, reserving 1/2 cup of pasta water if you want to add it to the sauce later. 2. In a large frying pan, heat 1 tbsp. olive oil over medium heat. Add tomatoes and cook until softened, about 12-15 minutes. Season with nutmeg, salt and pepper. 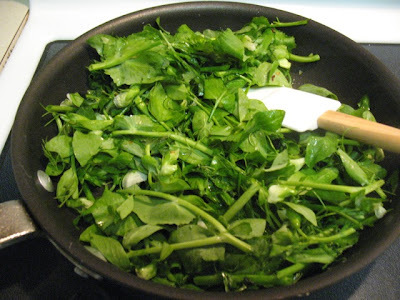 Add pea shoots and stir until wilted. 3. 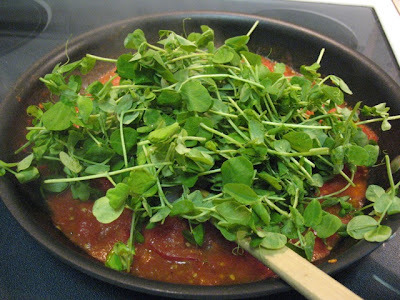 Add tomato-pea shoot sauce and ricotta to the pot of cooked pasta (and pasta water if using), stir until pasta is coated. Serve in a shallow bowl topped with a generous couple tablespoons of garlic scape pesto and a sprinkling of chives. 2. 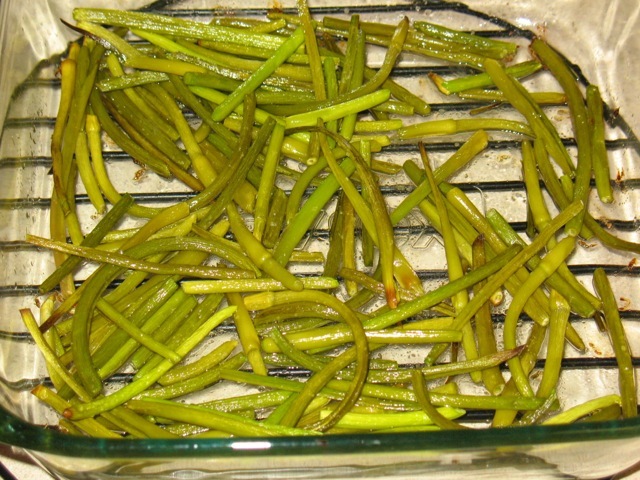 Place garlic scapes in a 9 x 9 roasting pan, toss with olive and season with a little salt. Roast for 20-30 minutes until fragrant and just starting to brown. Set aside to cool. 3. 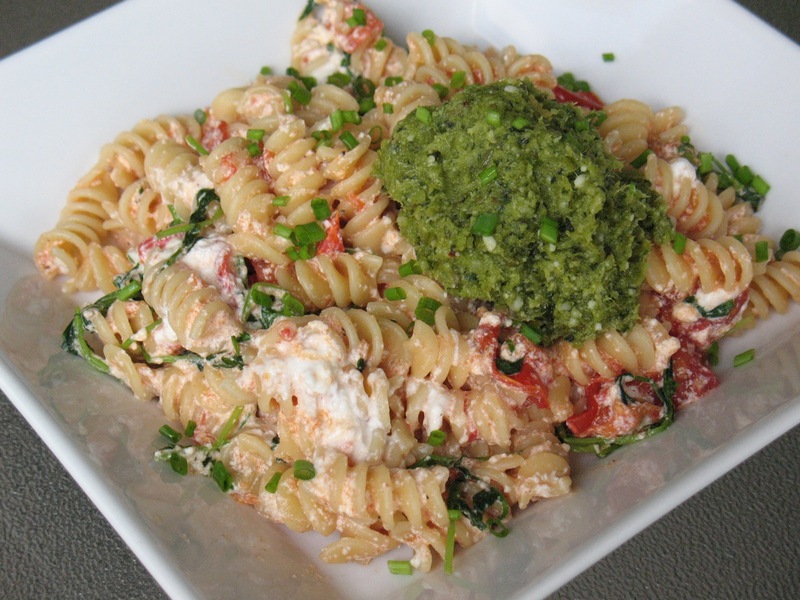 Add garlic scapes, pine nuts, basil and red pepper flakes to the bowl of a food processor. Process until well combined. With the machine running, slowly add the olive oil through the feed tube in a stream. Add additional oil until desire consistency is achieved (at this point, you can freeze any pesto that won't be used right away). Stir in parmigiano-reggiano before serving. Bobby's new wife Ann is beautiful, sophisticated and knows her way around a ranch. She's not too bad with a shotgun either. All of these skills make her an ideal Ewing woman. But certainly, like her forebears, she has secrets of her own as well. 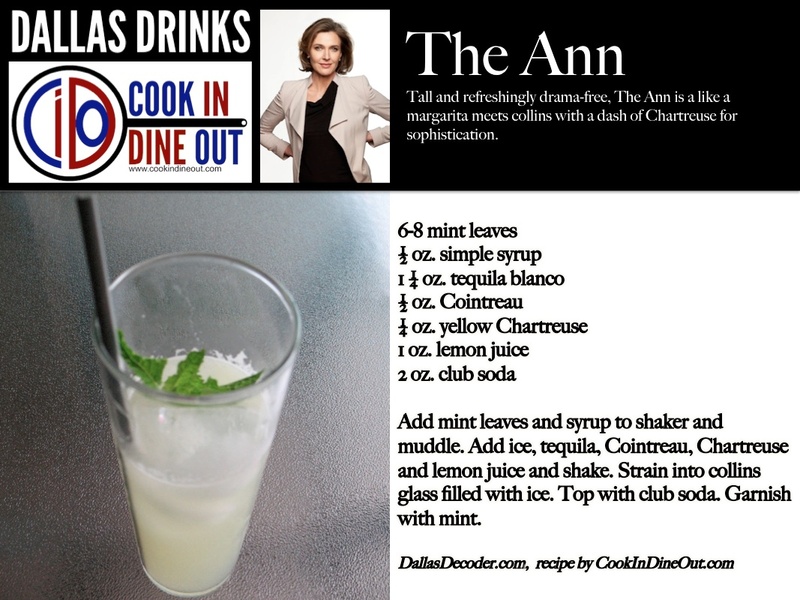 The Ann combines elements of a margarita and Tom Collins with the added sophistication of Chartreuse and the refreshing taste of fresh mint. I am quite thrilled that my neighborhood farmers market is open for the season. It's a really great market. While the Penn Quarter market is larger, since it has a variety of vendors, the New Morning Farm market often has better selection, since at Penn Quarter you tend to have like four or five people selling asparagus, but perhaps no one with cucumbers. New Morning Farm has a wonderful selection of vegetables, greens, herbs, fruit and berries, and a smattering of products from other vendors, including breads, eggs, cheeses and baked goods. Their outdoor-raised tomatoes, which will arrive later this summer, are amazing. As is their corn (also a coming attraction). Looking to be adventurous, I deliberately picked up a couple items that I've never used before: green garlic and pea tendrils. These are the kinds of ingredients you can find at the farmers market that the grocery store never carries. Too seasonal and not shipper friendly. 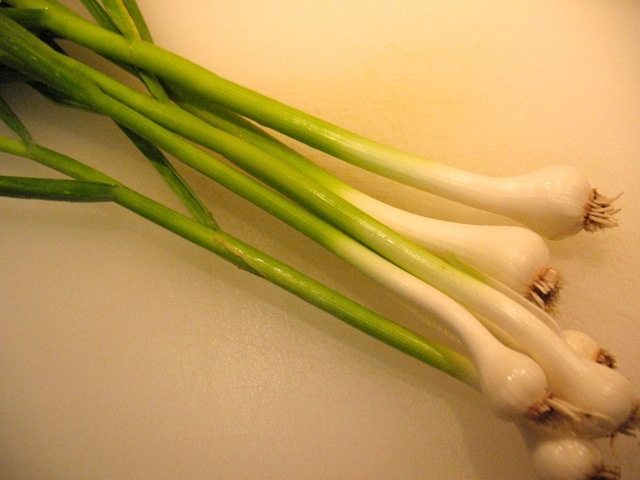 The green garlic has an amazing scent: like garlic, but milder, almost buttery. The pea tendrils smell great too and even had little white flowers on them. I decided to pair them with fish and, although I looked for some white fish options, I ended up with salmon. I'm glad I did actually, since a milder fish might have been overwhelmed with the flavors. I was able to punch things up a bit with smoked paprika and red pepper flakes. 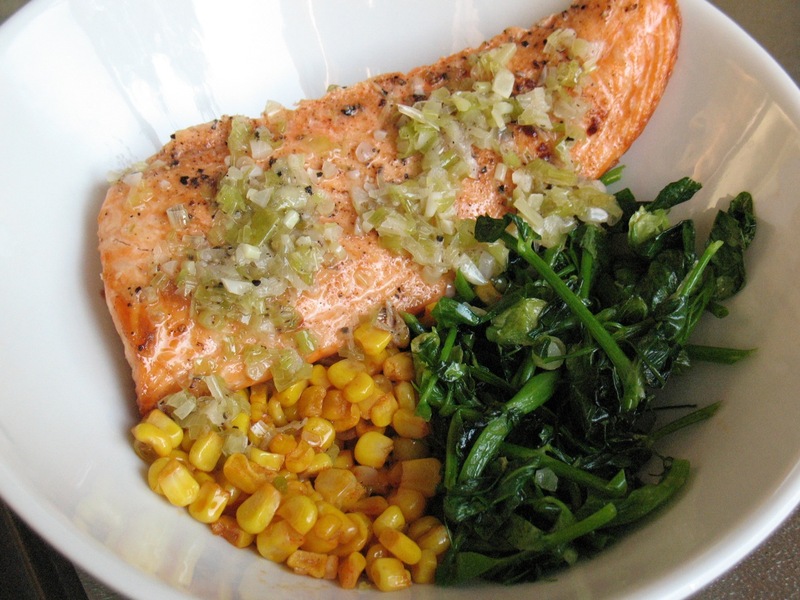 The corn was a last minute addition when I realized the salmon and pea tendrils alone probably weren't enough food. 1. Preheat oven broiler with rack positioned about 5 inches from element. 2. Place salmon fillet skin-side down on oiled, rimmed baking sheet. Spray fish with olive oil and season with salt and pepper. Broil 10 minutes, turning fish over after the first 5 minutes. Let cool and remove skin. 3. 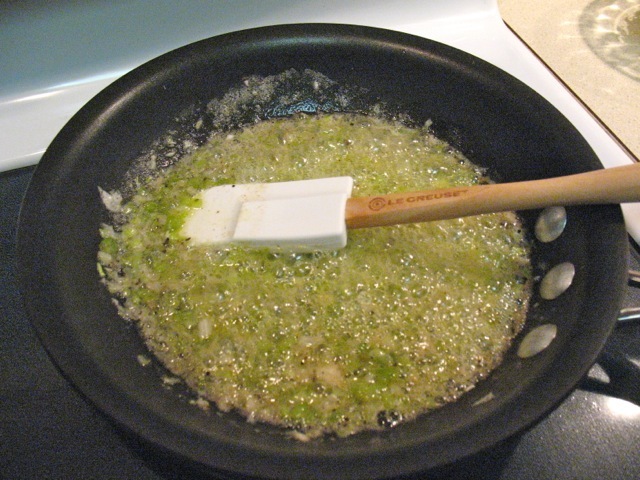 To make the green garlic butter, heat a small frying pan over medium heat. Add butter and green garlic and sauté a couple minutes until soft but not brown, reducing heat if needed to prevent burning. Add lemon juice and season with salt and pepper (makes about 1/4 cup). Heat olive oil over medium heat in a medium frying pan. Add green garlic and sauté 1 minute to let it start softening. 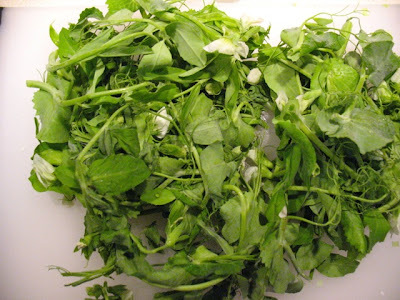 Add pea tendrils and sauté about 2 minutes, until wilted but still a but crunchy. Season with smoked sea salt, pepper and red pepper flakes. 1. Heat a medium frying pan over medium heat. Add 1 tbsp. green garlic butter. Add corn and smoked paprika and sauté until corn is cooked through, about 2-3 minutes. Dinner at Fiola comes with expectations set so high it would be a miracle for the restaurant to meet them. The Italian trattoria, which opened last year in Penn Quarter, has received the kind of first-year reception restaurants dream of: heady buzz, a three-star review from the Washington Post and a James Beard award nomination for best new restaurant. As it settles into its second year, Fiola has clearly hit its stride. Our recent dinner there was exceptional, marked by both good food and good service. The restaurant is perched at the eastern edge of Penn Quarter, the bustling centerpiece of downtown D.C. However, Fiola tucked away on the relatively quiet Indiana Avenue (although due to a developer's trick it has a Pennsylvania Avenue address), offering a respite from the onslaught of 7th Street. Its outdoor patio is the perfect place to quietly enjoy good food and conversation. Our expert server did an excellent job of reading our interests in food and wine, steering us toward elegant pasta entrees and balancing our preference for bold red wines with the more delicate flavors of the dishes we chose. Ricotta and mascarpone tortellini come bathed in a rich sauce of morel mushrooms and barolo wine reduction. Thank goodness we had those buttery rolls to sop it up. The lobster ravioli, which I heard a server tell another table is a signature dish, puts the emphasis on the lobster. 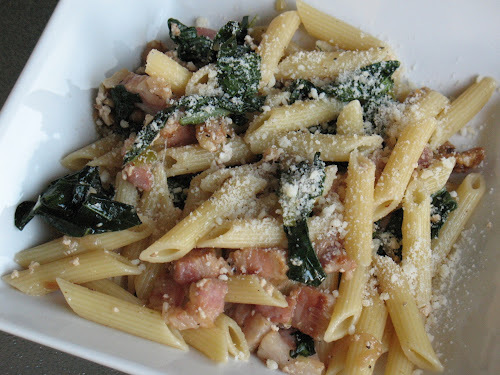 In addition to stuffing the pasta, there are generous pieces served on the side. Heirloom tomato panzanella is one of my summer staples, so when I saw it on the menu, I had to see how Chef Fabio Trabocchi interprets it. Rather well actually, with Texas-raised tomatoes that, if they are hot-house, disguise themselves expertly as grown outdoors. The meaty anchovies on the salad are quite tasty, a far cry from the overly salty ones at the grocery store. I also loved the combination of mint and prosciutto in a starter served with sugar snap peas and creamy stracchino cheese. An extensive wine list with numerous Italian and American choices compliments the menu well, as does the list of cocktails, which includes creative libations such as the "Fiola," basically a vodka Collins made with rhubarb syrup, and the Milan Mule, made with amaro. The dessert menu has some the usual suspects (a panna cotta, for example, although thankfully no tired ol' tiramisu). The Zuppa Inglese comes laced with blackberries and topped with a zesty lemon granita. The custard is a refreshing summer-appropriate way to finish a great meal. 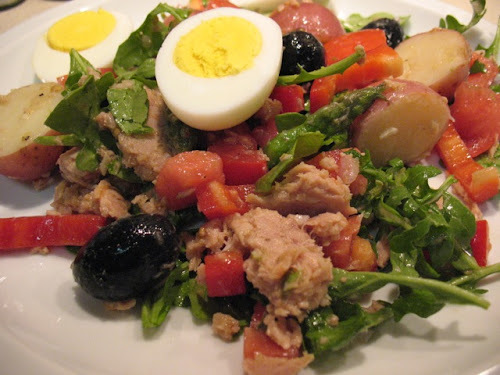 Niçoise salad is one of those dishes given to endless variation. Central to the dish is canned fish--anchovies, tuna or both--with lettuce, tomatoes, hard-cooked eggs, olives and vinaigrette. Fresh green beans, potatoes and red pepper are also common, but certainly cooks have taken it in different directions from there. For this salad, I wanted to take advantage of seasonal, late spring vegetables I picked up at the farmers market, including asparagus, new potatoes and a juicy beefsteak tomato. I also swapped out the lettuce for some baby arugula. 1. Bring a medium saucepan half-filled with water to boil. Add potatoes. After 2-3 minutes, add asparagus and cook for about 5 minutes (you may cook them separately and add additional cooking time for the potatoes if they are larger than about an inch thick). Drain and set aside to cool. 2. Put the eggs in a large (4 qt.) saucepan and cover with 1 inch of cold water. Heat on stove over medium-high heat until the water boils. Immediately remove pan from heat, cover and let sit 10 minutes. Fill a bowl with ice water. Remove eggs from hot water and put in ice water. After 5 minutes, remove from ice water, crack gently against hard surface and peel eggs (use the ice water to rinse off any shell bits). Cut cooked eggs in half. 3. Whisk together the olive oil, vinegar, shallot, garlic, mustard, salt and pepper to make the dressing. 4. Combine the arugula, bell pepper, olives, tomato, tuna, potatoes and asparagus in a large bowl. Toss with the dressing and serve with a couple halves of hard-cooked eggs. This week's Dining is the Summer Drinks Issue, and the staff managed to pull together a lot of cohesive content under this winning theme. Melissa Clark has the centerpiece story, which focuses on developing interesting cocktails as well as snacks to go with them. So the Golden Bowl, an anise-flavored whiskey cocktail, is paired with refreshing sounding White Bean and Fennel Dip. There are a lot of great ideas here. PDT's Jim Meehan contributes a short piece on curating a cocktail party, which he suggests can be accomplished by selecting an interesting "modifier" (i.e. a liqueur or an amari) to pair with a quality base spirit. Having a selection on hand will allow discerning guests to choose what they want. Complimenting both stories is the New York Times' new interactive cocktail recipe generator, which pairs a base spirit, with liqueuers and other mixers to make simple, classic cocktails. The most interesting article of the summer drinks stories was Eric Asimov's lengthy piece about gin, which includes an overview of the different styles, a brief history of the spirit, an admittedly biased take on the gin vs. vodka debate (I'm solidly with Eric in favoring gin) and a tasting of 20 American gins, which has become a thing apparently. My only gripe: I wished he'd have listed all 20 of the gins sampled and not just the 10 he liked best. Off-themed content that also interested me were Mark Bittman's How to Cook Everything column on making do with pantry staples, from which he made a Spanish-influenced shrimp dish (surely Mark's pantry is way more impressive than most peoples') and David Tanis' recipe for Cold Rice Noodles with Grilled Chicken and Peanut Sauce, which looks like a more vegetal version of pad thai. In this round of Food (Section) Fight!, the gloves are coming off at the Washington Post. Literally, as their feature story was an exposé by Aliza Green on how the common practice of using latex gloves in commercial kitchens may actually endanger food safety rather than promote it. The story includes the quite disturbing imagery of a gloved line cook handling raw chicken for a chicken salad and then handling the salad's vegetables without washing or changing gloves. Yikes. Tim Carman has an insightful story about two people who started an organic candy business, which serves as an entry into his look at the difficulties of organic certification (and contains the interesting tidbit that while "organic" is a strictly regulated term, "natural" is not). Tom Sietsema's First Bite showcases Bandolero, the second D.C. restaurant venture from Top Chef alum Mike Isabella. Georgetown's Bandolero promises to be as hot as his Chinatown debut, Graffiato, and I'm looking forward to my own first bite there in about a week. Some great recipes this week too. The back pages features recipes for summer soups, including White Bean and Corn Soup and Beet and Tomato Bisque. I'm also intrigued by Bonnie Benwick's Dinner in Minutes recipe: Linguine with Fennel Tuna Sauce. Here's a Food (Section) Fight! first: a tie. I love the Times' Summer Drinks Guide, but the Post packed in a lot of interesting and varied content this week. I really can't say which I found more enjoyable, so I'm not going to try. Kudos to both. 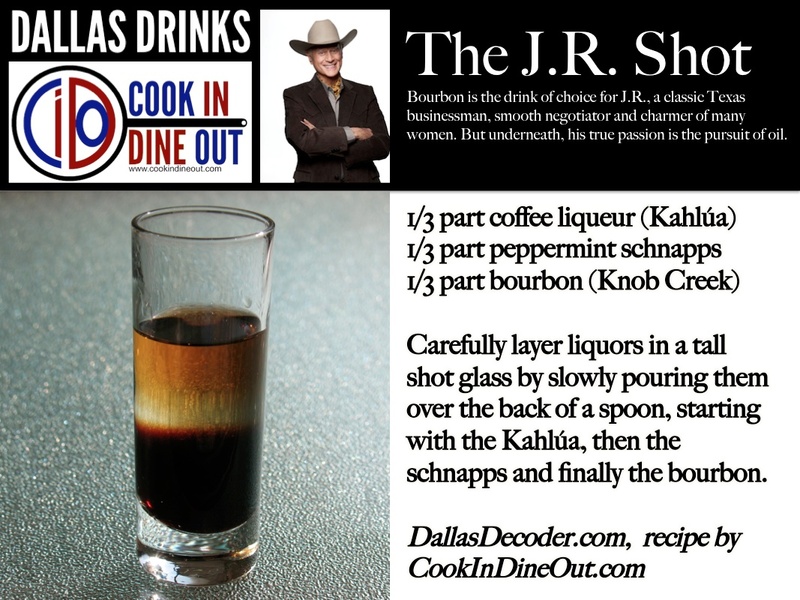 Today, I'm starting a new feature: Dallas Drinks, a co-creation with Dallas Decoder, honoring the characters of the new TNT drama Dallas, which continues the Ewing family saga that ran on CBS from 1978 to 1991. We've created a signature cocktail for each of the eight main characters of the show, which we will reveal weekly as new episodes air. It's perfect for your Dallas drinking game. First up is John Ross, the bad-boy son of J.R., Dallas' most notorious character. I'm probably biased because it was created by my husband Chris, but Dallas Decoder is the only site for commentary and nostalgia for the original series, with daily episode critiques, essays and style commentary. With the debut of the new series, Dallas Decoder is also following the TNT series. Check out the review. Chili is a dish that can elicit strong opinions. I've seen notable sources claims that chili is 1) a preparation of meat and chilies that should not contain beans and 2) basically beans cooked with cumin. Whoa. Sounds like a smackdown in the making. 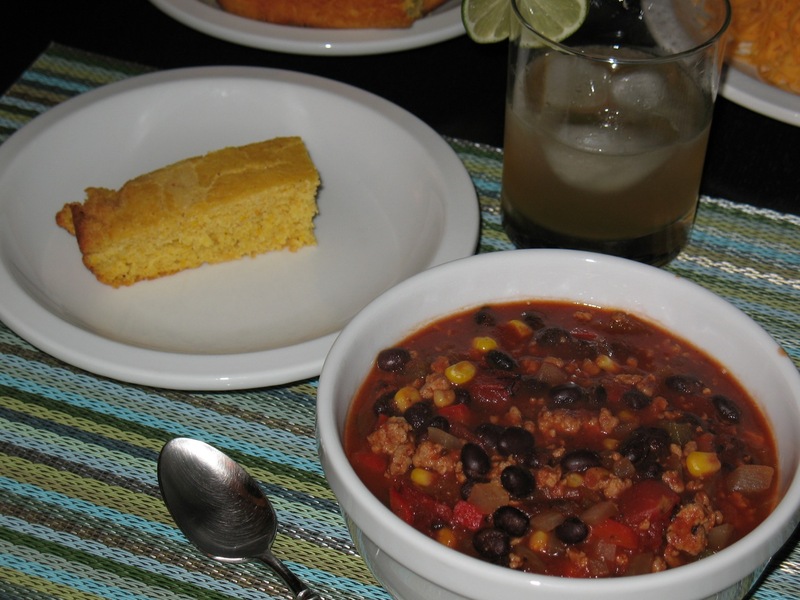 Regions play a role in defining chili. Texas chili, for example, is known to contain meat and chilies and nothing else, while Cincinnati chili includes cinnamon and chocolate and is often served over spaghetti. I like mine with either ground beef or the lower-fat alternative of ground turkey. I also like lots of vegetables. Call it a chili stew if you like, but I don't care. It's really good. 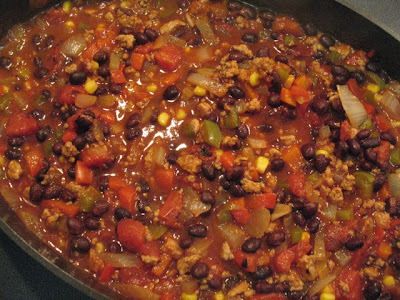 I season my chili with a mixture of chipotle chili powder, cumin, dried oregano, seasoned salt and fresh-ground black pepper. For the sauce, I use tomato paste, balsamic vinegar, Worcestershire sauce, and chicken broth. To impart a pleasing smokiness to the dish, I use a combination of liquid smoke flavor and smoked paprika, in addition to the chipotle chili powder, which is also smoky. Read between the lines and you'll see the flavors of barbecue sauce, and in fact years ago I used to make this chili with barbecue sauce and beer, although I've refined the recipe a bit since then. 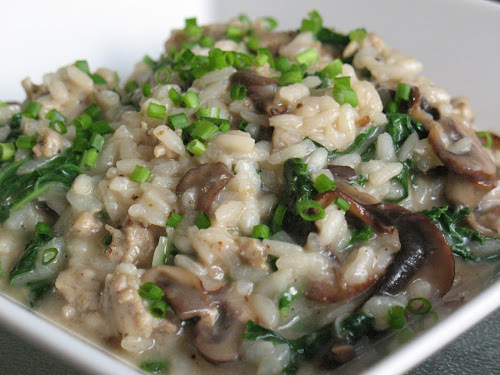 It's a pretty versatile dish, so feel free to play around to find flavors that suit you. 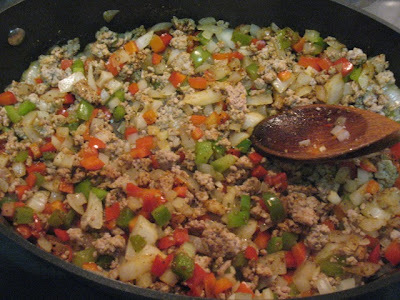 When sautéing the ingredients, I like to use a large oval sauté pan so I can set part of it over the heat and then move the ground meat off the heated area once its browned without having to take it out of the pan. It's a trick I learned years ago watching Rachel Ray, and I find it saves times. Using a large oval sauté pan allows you move the meat to one side while sautéing the vegetables, rather than having to remove it from the pan. Yes, the ingredients list is long, but this is a forgiving recipe, so omit/adapt as you feel fit. 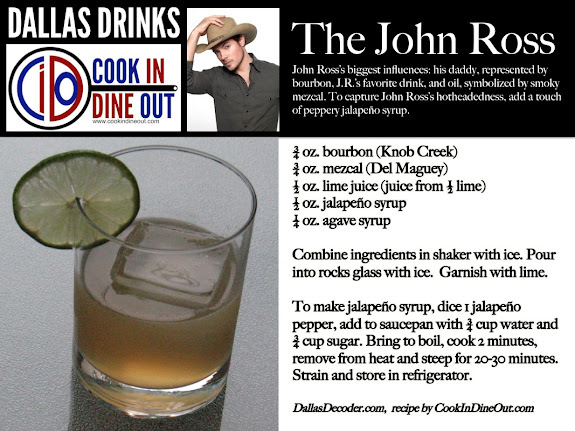 And by the way, it's really good served with corn bread. 1. Heat a large sauté pan or dutch oven over medium heat. Brown ground meat and set aside or push to side of pan off heat. Drain off any rendered liquid (when using turkey, it produces a lot of water, and I find removing it before adding the vegetables makes them cook faster). 2. 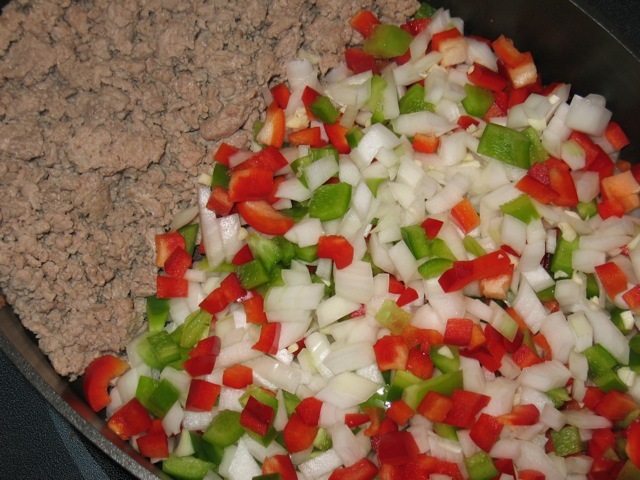 Add bell pepper, onion and garlic to pan. Sauté until softened. Stir with ground meat and add spices through brown sugar. Sauté a couple more minutes until vegetables take on a little color then add all of the rest of the ingredients through chicken broth. Cover pan, raise heat to medium-high until it bubbles. Stir well and then lower heat and simmer, covered about 10-15 minutes. Serve in bowls topped with shredded cheese. A few weeks ago, I mentioned a smoky cocktail with ginger beer from District of Pi. 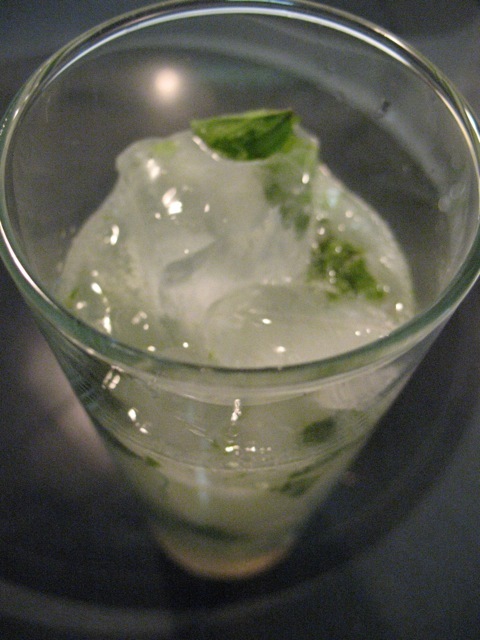 It inspired me to make this drink, which features muddled fresh oregano. The star player her is mezcal, a Mexican spirit similar to tequila but with an intense smoke flavor that comes from roasting the maguey, the form of agave that is the liquor's basis. I see mezcal more and more on cocktail menus these days and after using it, I can see why. Its smoke flavor is much more intense than that of scotch, another spirit used to add a hint of smoke. There's no hint here; more like a punch. For this drink, I used the Del Maguey brand Vida mezcal. A lot of the mezcals on the market come with a worm or other dead animal sitting at the bottom of the bottle. I find that rather repulsive. Del Maguey has no use for such gimmicks and I believe their spirits are generally regarded as higher quality than the brands with the bugs. 1. Squeeze the lime juice into the metal cup of a Boston shaker. Add the oregano leaves and use a muddler to crush the leaves into the juice. Add ice, agave syrup and mezcal and shake until cold. Add ginger beer and poor mixture into the other cup to combine then pour into a collins glass with some more ice. Serve with a straw.